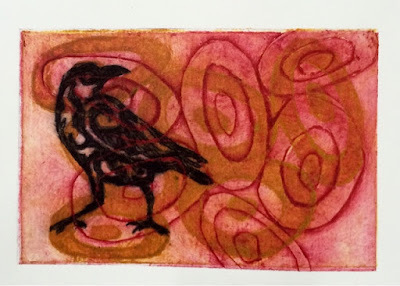 I am really enjoying my printmaking classes. 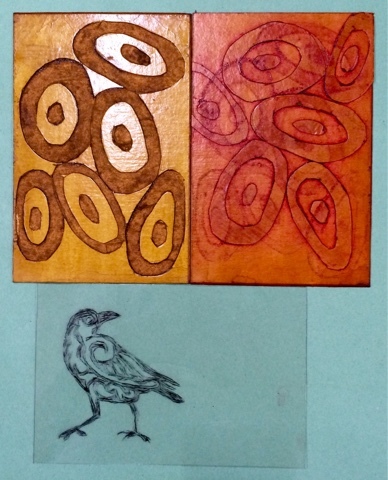 The last two have covered dry point etching onto copperplate and acetate sheet and creating shellac plates. It is great to be in a relatively small class that has participants with very diverse skill sets and for the 'old hands' to be so encouraging of the 'newbies' or beginners such as myself. 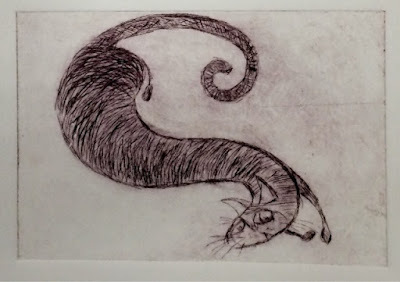 I am focussed on learning the techniques and less concerned with the image itself and trusting that time and exposure will help me to become a more confident in my drawings. Our tutor, Gaye, encourages us to document each technique and keep a record of the processes involved. 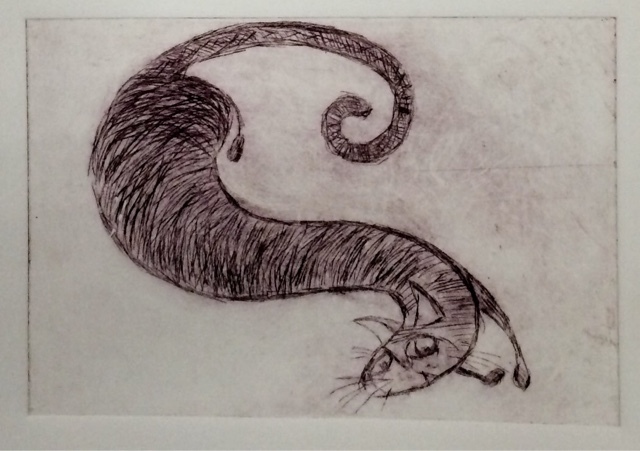 This print is the first from the plate. This can be used to decide if I want to do more work on the plate. This is the plate. 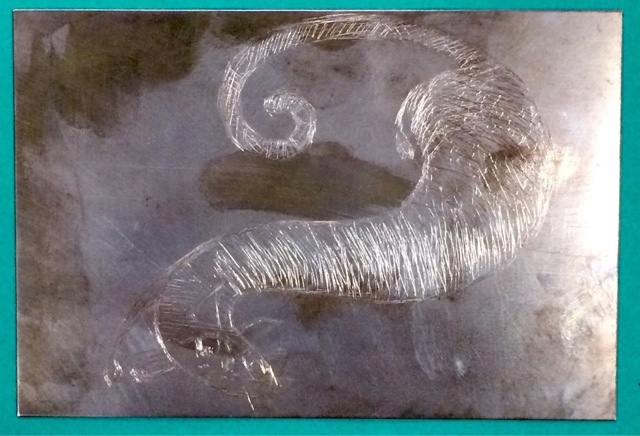 The image is drawn / scratched directly onto the plate. The raven/crow plate is also a dry point etched or scratched into acetate. The other two plates are shellac plates. There were many plates prepared and some carved, however, they are for the next class. The process for today was multi plate prints. For this technique the print is done in three stages. 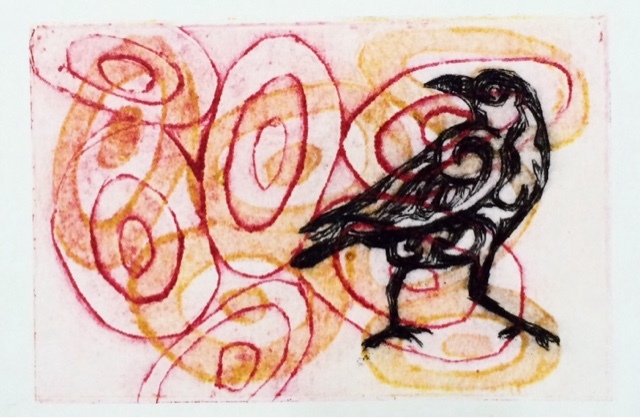 The first plate printed was the yellow circles, then the red and finally the black crow. This the ghost print that was taken from the acetate sheet. The image is much lighter as there is little ink left on the sheet. 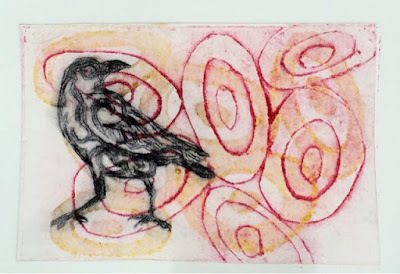 This print was created by using the first print and covering it with another piece of paper and running it through the press again. It is a bit like blotting the original and prints in reverse.